Harishchandragad FortHeight : 4000 ft. 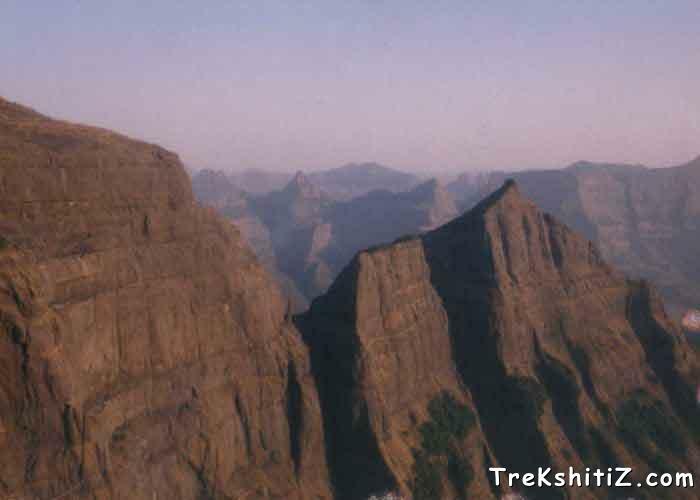 Most of us have either visited or heard somewhere about Harishchandragad. Yes friends, the most prominent, fabulous & significant from all points of view. As a guard of Malshej Ghat, the fort has played a major role in guarding the surrounding region. The fort is quite ancient. Remnants of Microlithic man have been discovered here. The various Puranas (ancient scriptures) like Matsyapurana, Agnipurana and Skandapurana include many references about Harishchandragad. Its origin is said to have been in 6th century, during the rule of Kalchuri dynasty. The citadel was built during this era. The various caves probably have been carved out in the 11th century. In these caves are idols of Lord Vishnu. Though the cliffs are named Taramati and Rohidas, they are not related to Ayodhya. Great sage Changdev (one who created the epic �Tatvasaar�), used to meditate here in 14th century. The caves are from the same period. The various constructions on the fort and those existing the surrounding region point to the existence of diverse cultures here. The carvings on the temples of Nageshwar (in Khireshwar village), in the Harishchandreshwar temple and in the cave of Kedareshwar indicate that the fort belongs to the medieval period, since it is related to Shaiva, Shakta or Naath. Later the fort was under the control of Moguls. The Marathas captured it in 1747. The last warrior named Joshi became a martyr in the fight against the English in 1818. To the east of the temple is a well-built lake called �Saptatirtha�. On its bank are temple-like constructions in which there are idols of Lord Vishnu. Recently these idols have been shifted in the caves near the temple of Harishchandreshwar. These days many trekkers have been responsible for the sad plight of this beautiful place, as they throw plastic wastes and other things in the pond. 7 years back the water was potable, and now it isn�t suitable even to swim. Going rightwards of Harishchandreshwar temple, we come across a huge cave. This is the cave of Kedareshwar, in which there is a big Shivlinga, which is totally surrounded by water. The total height from its base is five feet, and the water is waist-deep. It is quite difficult to reach the Shivlinga, as the water is ice-cold. There are sculptures carved out here. In monsoon it is not possible to reach this cave, as a huge stream flows across the way. The most interesting point on this fort is this cliff, which has always fascinated many people from many years. From here, one can have a breathtaking view of the surrounding region & the setting sun. This cliff is not straight, but concave in its topmost approach. This feature renders it distinct. It has been accessed by rock-climbers only twice till now. Members of Pinnacle group recently ascended this cliff, after 12 years it was ascended for first time. A youth from Pune fell in love with this cliff & jumped from here. A monument is built here in his memory. It is said that a rainbow as a circle is seen from here. These caves are situated all over the fort. Many of these are situated at the foot of Taramati peak & are the place of accommodation. A few are near the temple, whereas some are near the citadel and some far away in the forests. A natural cave is on the northwestern side of the fort, to the right of Kokan Kada. It is about 30 feet deep. The folks must know many such caves. Many of these may be remaining undiscovered. This is a great antique construction, and diverse artistic works are seen on this. On the ceiling of the temple are beautiful carvings. There are caves near the temple. This temple is marvelous example of the fine art of carving sculptures out of stones that prevailed in ancient India. It is about 16m high from its base. Around this temple there a few caves & ancient water tanks. Near the temple, the river Mangal Ganga originates. The top of the temple resembles construction with the north-Indian temples. A similar temple is situated in Buddha-Gaya. Here we can see many tombs, in which a typical construction is seen. These are built by arranging stones one over the other. The stones are well finished. There are three caves near the temple. The cisterns near the temple provide drinking water. Here another temple called Kashitirtha is located. The fascinating thing about this temple is that it has been carved out from a single huge rock. There are entrances from all four sides. On the main entrance there are sculptures of faces. These are faces of guards of the temple. On the left side of the entrance is a Devnagri inscription, which is about saint Changdev. One has to board the bus for Nagar from Kalyan & alight at �Khubi Phata�. From there we reach the village of Khireshwar by bus or private vehicle. This village is at 4km from the foothills of the fort. The way beside the caves, where water tanks are seen, proceeds further to Junnar Darwaaja (Entrance From Junnar). From here, the route goes straight to Tolar Khind. Walking a few minutes from Tolar Khind, we come across a rock-patch on which railings are fixed. After ascending the railings, we come to the plateau region on which less dense forests are seen. From here, we have to cross 7 hills & after a walk of 2-3 hours, we reach the temple of Harishchandreshwar, the temple of Lord Shiva. Note: On this way, many arrows help in indicating the way. The third way is specially meant for hikers, which is via Sadhleghat. One should board the bus for Malshej Ghat & go to the village of Belpada. From here, the route goes through Sadhleghat. Here one has to climb a straight rock patch on which grips are provided. The temple is situated at a height of about 1km from Belpada. The total distance is about 19km. Ganesh caves & caves near the temple of Harishchandreshwar. In Khireshwar, local school is the best for a night�s stay. In this village, we can see the beautiful temple of Nageshwar as well as ancient caves of the Yadav era. In summer & winter, arrangement for food is available on the fort. However, in monsoon, one should make the arrangement himself. The water tanks near the caves. In monsoon, proper care should be taken.